In advance of a food blogger’s night out with author Gil Marks, I leafed through his book The World of Jewish Cooking. The recipe for Couscous with 7 Vegetables caught my eye both because it was vegetarian (optional) and a special Rosh Hoshanah dish. In the end I was under too much pressure before the holiday to try something new. But when I noticed some whole-wheat couscous in the store a few days later, I snatched it up. Couscous is made from semolina. Couscous are partnered with tagine, a spicy meat or vegetable stew. It’s a Moroccan specialty I’ve always to try. So last week I took the opportunity to make the couscous for my family and my dinner guests. My daughter put together the tagine while I prepared the couscous. The tagine only required cutting up vegetables, but the couscous recipe called for soaking them, adding oil and stirring, steaming, removing them to a bowl, adding salt water, stirring again, and steaming them once more. All of this effort goes to ensuring that the couscous don’t stick yet remain fluffy. Marks advises using a cheesecloth if your steamer’s holes are too large. Since I don’t own a special couscoussiere, a pot and steamer insert with small holes, I used a pasta pot and insert. I lined the insert with a thin cotton cloth that was really too small and the result was messy. In the end the couscous came out quite fluffy. This created a problem–the couscous was nearly all eaten, but the vegetable tagine wasn’t. I was too busy with my guests to insist that the kids try it. My son, daughter and I loved the aromatic spice combination of the tagine. My guests didn’t comment at all. The next day my son asked me whether I planned to make more couscous for the l tagine, and I told him I would make rice. “You can’t do that,” he said. So I set out to find out if there was an easier way to make the couscous. Luckily, I have resources. First I tagged Israeli Kitchen, Baroness Tapuzina and Sarah Melamed on Twitter. They’ve all made couscous before, and Sarah has even made the pasta from scratch. She led me to the Moroccan Cooking Group on Facebook, where I got answers to some more questions. After the recipe, I’ll share the tricks I used to make this recipe a little simpler. If using chicken, add the six cups of water, bring to a boil, and simmer for half an hour. Remove bones, shred the chicken, and return to the pot. Add carrots, onions, turnips, celery, and spices to water or stock. Cover, reduce heat to low, and simmer for 30 minutes. Add squash, cabbage and chickpeas or fava beans. Cook until tender, about 20 minutes. Add coriander or parsley. Smash chickpeas or squash into stew for a thicker sauce. Spoon cousous onto large deep-sided platter or into individual serving bowls. Make a well in the center and fill with vegetables. Pour some broth over the couscous. Sprinkle 2 cups cold water over couscous, drain, and let stand for 15 minutes. Drizzle with the oil and stir with a fork or your fingers to separate the granules. Spoon the couscous into a sieve or colander, place over boiling water or stew, cover and steam for 10 minutes. Spoon the couscous into a large dish. Sprinkle with the salt water and stir with a fork to separate the granules. Return the couscous to the steamer, cover and steam until heated through and tender but not mushy, about 20 minutes. Heap the couscous onto a warm serving platter and stir with a fork to separate the granules. Leave the peel on the squash or pumpkin. I first saw this tip in Lorna Sass’s Vegetarian Cooking Under Pressure. My friend Daphna told me that when her husband visits France and stays with Tunisian friends, they serve pumpkin with the peel. They claim it helps keep the pumpkin from falling apart. So we can say that is an authentic North African tradition. Use a large cheesecloth. Sarah Melamed suggested getting a diaper or burp cloth from the drugstore since it is the same weave as cheesecloth. The large size covered the steamer insert with room to spare (just don’t set it on fire!) I have been unable to find cheesecloth in fabric stores over the years. Unfortunately they came in a package of 6, with 3 of them printed. Either some lucky baby will be the recipient or I will use them as cheesecloth anyway. Keep enough water in your pot. The problem with this pot was that the water level has to remain low or the couscous will get cooked instead of steamed. We added water and brought it to a boil after the first steaming. Remove the couscous from the pot using the large cloth and place it all into a bowl. We added the salt water, stirred, and used the cloth to return the couscous to the pot. Sarah said she uses the cloth even though she owns a couscousssière (couscous pot). Steam the couscous only twice, like in the recipe above. Apparently some Moroccan chefs steam it three times. Prepare the couscous in advance. 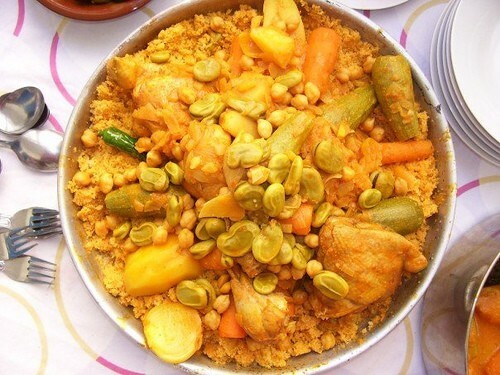 On the Moroccan Cooking page, I learned that couscous do not have to be served hot. In fact, heating them for too long makes them mushy. We prepared them in advance and brought them up to room temperature—they take their heat from the broth in the tagine. Prepare the chickpeas in advance, unless you are using canned chickpeas. See my post, The Complete Guide to Preparing Dried Beans from Scratch. If you use chicken, skip the shredding. I did make the recipe with chicken. I cooked the pieces in the water for half an hour, removed it to a plate, and replaced it when I added the second batch of vegetables. Just be sure that it is fully cooked before serving–I served it on a platter separate from the tagine and couscous. Choose serving platters in advance. Ideally, couscous are served in a deep, large platter. I don’t own one so I put the couscous and some broth on a shallow platter. The tagine and broth went into a large serving bowl. We are planning to make couscous into a regular event around here. My family is a big fan of his Yeminite Tagine cooking- and it’s so easy, it’s just mixing up the spices and cooking with a bit of broth. I’ve also made his Tovuk Pulov more than a few times. I’m a big fan of his! I say to go for the instant couscous. You buy it, mix it with boiling water, oil, and salt, and let it sit for about 5 minutes. It tastes fine to me. It’s not particularly expensive either. Nope, actually the frozen is even better. No comparison to the instant. Abbi, I don’t know what that is but will have to try it. LeahGG, I recently had the instant and there was no comparison to fresh. Hannah- in the freezer section of many supermarkets, you can find frozen “fresh” couscous. It’s usually with other oriental foods like frozen kubeh, stuffed grape leaves and cigars, etc. It can be a bit salty, but it’s the “real thing”. When I’ve made tagines, I defrost it and steam it over the stew pot for Friday night dinner. The kids go crazy for it. Okay, Abbi, I’ll have to check it out. Just found ur blog, I love it!! I’m been looking for a good recipe for this for years but the whole couscous thing sounds tricky, gonna try this with the instant and let u know how it goes . I’m do not like cooking but u make it look fun! Thanks so much, Chanale! I made it again last week. It helps to have a teen daughter who prepared the couscous, while I made the tagine. I totally underestimated how long it would take to heat everything up and ended up in a panic, but it came out great. I’m going to look for other tagines to try. Perhaps some experts can weigh in here? Okay, I was corrected. According to Gil Marks: Couscous is rolled semolina granules made from crushed — not ground — semolina, the endosperm of durum wheat, bound with water. Unlike pasta, couscous is not flour kneaded into a dough, but instead two parts smeed (finely crushed semolina) is placed in a large shallow earthenware or wooden bowl, gradually sprinkled with salty water and one part semolina flour, and stirred in a circular motion or rubbed with the right hand, the starch accumulating around the semolina granules to form progressively larger bits.